News reached us on 20th August that English Heritage, who have twice previously refused to list Forest Hill Pools, have decided to list Louise House including many of the internal features. What the future now holds for Louise House is uncertain as is the future of swimming in Forest Hill. The three options presented by the council for the redevelopment of the pools are no longer possible and alternatives will need to be found. For The Forest Hill Society our main concern now, as it has always been, is the future of swimming on this site. We call on the council to come up with innovative solutions to allow for a leisure centre on this site with two pools and community facilities. At present this looks like an onerous task, but the council need to find a way to make this possible within the new constraints. What must not be allowed to happen is for this decision to mark an end to swimming in Forest Hill. The following day, on the 21st August, there was a public meeting to discuss the options for development of the site. 200 people attended the meeting where a range of views were expressed. Notes on the outcome of the meeting is available on Lewisham Council website. The mayor and cabinet will meeting on 17th September and will be discussing the outcome of the consultation and development options. Below is the text of the Forest Hill Society submission regarding planning application DC/08/69339/X, 15 Westwood Park. On behalf of the Forest Hill Society I wish to object to the proposed development at 15 Westwood Park which we believe is over development of the site and will have a detrimental effect on the local area. ‘The Council will require developers to retain any attractive or ecologically important existing natural features of a site’. We would ask that the planning officers to ask for tree planting as part of any future development to remedy this loss of trees on the site. Whilst we welcome the building of family housing rather than flats at this location the density levels are too high for this suburban location. We understand that the density level is approximately 300 habitable rooms per hectare and this is significantly higher than outlined in policy HSG 16 which recommends denisty of 180-210 habitable rooms per hectare. The location of this development is not in a sustainable living area and is some distance from Forest Hill station with a substantial hill that impacts on the desirability of high density housing on such a location. In relation to the London Plan (table 3A.2) this recommends a range of 150-250 habitable rooms per hectare in a suburban setting, outside the town centre and with a considerable hill separating the site from all public transport. This application has exceeded the maximum density recommended by the London Plan on a site that is unsuitable for such density. We recommend that the planning officers reject this application based on the high density levels on this site contrary to council and GLA policy guidance. Plots 1-3 only have a single door between the kitchen and the toilet. We would seek clarification from the officers whether this is in contravention of planning regulations. Many of the bathrooms higher than ground floor level, have no natural light or ventilation. We would recommend that for a more pleasant internal environment, and to save energy that as many of these bathrooms as possible have natural ventilation. In modern buildings we would expect to see the inclusion of windows to allow for natural light and energy saving without impacting on overlooking of other properties, however, with such high density levels on this site such provision would be very difficult. ‘Family dwellings should be provided with their own private garden area. Normally, a minimum garden depth of 9 metres will be required.’ None of the gardens on the site meet the desired depth set out in this policy. Cars reversing from the garages and the access road create a concern because of the nature of this road. On this side of the road there is the peak of a hill directly before these houses. Cars exiting from the site will have little visibility of on coming traffic and any cars needing to stop to let them out would create a hazard for more cars coming over the hill. This problem of lack of visibility will only be exacerbated by the need for plots 1-3 to park on the road rather than in driveways or garages. Policy HSG 8d states that there must be a proper means of access, suitable for the entry and egress of service vehicles which is convenient and safe both for drivers and pedestrians. We do not believe that this egress is safe for other road users or convenient for residents. Horniman hill has many springs and underground waterways located on it. This has lead to the peculiar architecture of the Horniman School located in close proximity to this site. It is our concern that significant excavation and building on this location could lead to flooding and subsidence for houses in close proximity and further down the hill. We would ask that a full assessment of the affects of this backland development on neighbouring properties is undertaken and includes water surveys for the site. We believe that for the reasons stated above the council should reject this application. Below is the text of the Forest Hill Society submission regarding planning application DC/08/69263/X, 4 Redberry Grove. On behalf of the Forest Hill Society I wish to object to the proposed development at 4 Redberry Grove which we believe is out of context for the local area. Redberry Grove is very special road in the Sydenham Park conservation area and the development of a building that is substantially out of character will have a significant affect on the nature of the conservation area in close proximity to an area of nature conservation - Albion Millennium Green which has only recently been designated as such. By developing a new backland development in such close proximity to Albion Millennium Green we are concerned that it will have a negative effect on this area of nature conservation and access to it. Additionally 3 Redberry Grove is a listed building and again this proposed development would negatively impact on the context of this listed building. Whilst the design and the materials used for this building are state of the art and make a very interesting modern building these are totally out of context within the conservation area, which is primarily one of large Victorian houses which have been well preserved due to the conservation area. It would be a great shame to spoil this area of outstanding Victorian architecture by the discordant nature of this development. Policy URB 5 sections c-g should be taken into account when considering this development and we believe the council should reject this application. Below is the full text of the submission from the Forest Hill Society on the pools consultation. We understand that this may not fully represent the views of every single member of the Forest Hill Society or of the wider community but it is the considered opinions of a number of residents who have been involved in understanding the council's plans, and with experience as architects, developers of conservation schemes, health professionals, active swimmers, and parents, and we have listened to many views from local residents to make sure that we do represent a significant section of local residents. The Forest Hill Society welcomes London Borough of Lewisham’s commitment to swimming in Forest Hill, and the promise of “no demolition without consultation”. Whilst we welcome the three options presented as part of the consultation, we have some reservations about the options offered and consultation process so far. 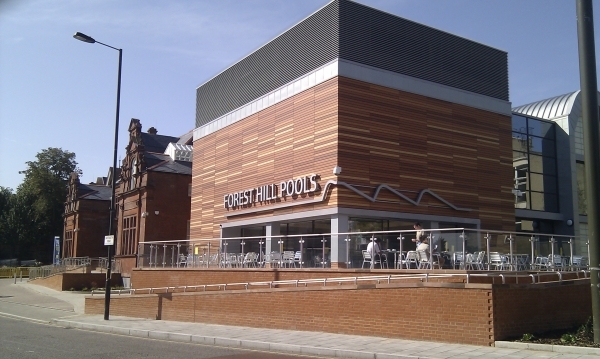 As the Forest Hill Society we believe that an improved leisure facility on the site of the pools and Louise House is vital to the continued success of Forest Hill as a town centre. These facilities will attract people to the area and they will use other local facilities such as the shops and library at the same time. We have collated feedback from local residents and have already passed on some of the best ideas to the council through the stakeholders’ meetings. The need for two pools – a main pool and a learner pool. We think that a strong connection between the library and the leisure centre is really important and envisage an overlap of courses between the two buildings enhancing the offering from both. The learner pool could have a moveable floor to make it suitable for children of different ages and for hydrotherapy. According to the architects present at the station display this would not add significantly to the overall cost of the project (the figure of £100,000 was quoted). The community area should include a regular shaped space for use as a large meeting hall (for up to 150 people), but more often can be divided into 2 or 3 rooms which can be used for education or for sport or community groups. Innovative sporting facilities would help make the facility popular and well used e.g. a climbing wall and possibly boulders for non-supervised climbing outside the leisure centre. More retail units are not required when there are already many unoccupied retail units in the centre of Forest Hill. A cafe is a good idea and should overlook the pool, with easy access for parents to move between the cafe and the changing area to assist their children. Parking needs careful consideration, especially if there is to be additional housing on the site. We would not want to see a CPZ imposed on Derby Hill, Thorpewood Avenue, and Derby Hill Crescent, but there would need to be controls over car use for any residents of the properties on the site. With recent developments in Forest Hill there does not seem to be a way to implement car-free developments without the imposition of CPZ on all local streets. Lewisham council needs to look at other ways to ensure car-free developments for the life of these properties. The entrance of the leisure centre in all options is on the north side of the development making the public area and entrance north facing with little direct sunlight, but more importantly it is at the furthest point from the library, ‘turning it’s back to the library’ as some have put it. The link between the leisure centre and library looks like an afterthought rather than properly connecting the main part of the leisure complex to the library, although if a link at the library floor level could be made to work this could be very successful. We would prefer a building that is designed in sympathy with the library with a coherent frontage rather than showing disregard for a fine grade 2 listed building. The design of the centre needs to be improved to compliment the library rather than as a blank modern building to ‘avoid diverting attention from the library’ – something that option 3 certainly fails to do. The Horniman Museum extension is an excellent local example of how a modern building can be integrated into an existed listed building in a coherent way. We understand that there is a target of between 35% and 50% social housing on the site. Given that any profits from developing houses on the site will go directly into a community facility we believe that social housing should be minimised. That is not to say that there should be no social housing, but that a maximum of 20% would be more appropriate to allow for the best possible leisure development on the site. We are aware that Lewisham Council wish to see 35% social housing in developments of this size, but given the community benefit of profits going directly into the leisure centre it would make sense to adjust this target in this specific case. In Option 3 the seven story development is out of character with the streetscape of Dartmouth Road. The high rise (7 storey) housing is too close to the road, built over the pavement and completely out of proportion to the other side of Dartmouth Road. This results in a strong physical separation between the part of Forest Hill with the pool to the north and the part of Forest Hill with the library to the south. We are not happy with the scale or location of the housing along the frontage of option 3 and think that this needs serious reconsideration with alternative arrangements and locations explored e.g. along the back of pools building or around the square. There is plenty of room for extra housing to be built above the changing area and car park to the rear of the leisure centre. There are already large trees to the rear of the houses on Derby Hill Crescent that would prevent overlooking from this position. Access could be from the rear of the public space (possibly the same access as the flats aligned with Kingswear House). This is just one solution and we are sure that there are others that could be explored but have not been as part of this consultation. Further housing may be possible above the garages to the rear of the site on Torcross Drive. By redeveloping these garages to providing some residential areas above the garage facilities, less residential development would be needed at the front of the site. The loss on the pocket park is not a significant loss to Forest Hill with Baxter’s Field not far from the site and the new public space created on this site. We hope that prior to awarding the contract for building the leisure centre other design options are considered, ideally opening up the process to a design competition. We understand that these designs were put together primarily to give an idea of bulk and massing and residential unit numbers, but they fail to show how different layouts for the site have been tested. We could easily be stuck with a sub-standard design for decades to come if the process now proceeds too quickly and without careful thought and proper consideration of what is possible, including allowing the architects selected through the OJEU process the opportunity to bring their creative design skills to the project. From the three options presented by the council we believe that option 1 is not right as it does not include a learner pool. Options 2 and 3 both provide a better facility and although we are keen to maximise the leisure and community facilities available on this site, we do not believe that the housing set out in option 3 is the best way to achieve this. We have been disappointed with the consultation process for a number of reasons and we do not believe the council have engaged properly with the local community in regard to this development. This beginning sets a bad precedent as we move forward to the implementation phase. Lack of different designs available for public consultation. The consultation has been open to people from across the borough, starting off in Catford, rather than focusing on the residents of Forest Hill. Leaflets that were delivered to local residents were delivered too close to the beginning of the consultation and were simple white A4 sheets. In the 2005/2006 consultation the consultation document itself was delivered to every house, this should have been done again to get maximum feedback. Instead residents have to go to the library to pick up a leaflet or have access to the Internet for the online consultation. The display in the library and the presentation of the three options in the consultation document significantly simplified the options and did not provide the full details that were in the full documentation that was available on the website. Copies of the full consultation document and historical report should have been available in the library to allow visitors to see the full context of the consultation. Despite a feasibility study being undertaken to determine if Louise House and the Superintendent’s House could be saved and incorporated into a new development, no designs have been produced to show if a leisure centre could have been fitted in with this development. Many local residents naturally feel angry that this was not presented as an option after the feasibility study was undertaken and concluded that these building could be converted into housing for a small profit. The consultation process took place during school holidays, when many children and parents are away. This will affect the results of the consultation and exclude many of the key users of the pools. A public meeting should have been organised where local residents could have an opportunity to discuss the plans with the council officers and hear the views of other local residents. There has been a lack of clarity for local residents regarding what the consultation is about – housing and leisure facilities or design of buildings and layout. By confusing these two issues it is difficult for the public to know how to respond. We would like to see all the responses to the consultation to get a better idea of the views of local residents before the report goes to mayor and cabinet, so that we can satisfy ourselves that council officers accurately represent the views of local people from this consultation. As a recap - in February 2008 the Mayor of Lewisham approved the redevelopment of the Forest Hill Pools and Louise House site in order to bring new leisure facilities to the area. The Stakeholder Group (an inclusive Group of the key stakeholders including representatives from the Sydenham and Forest Hill Societies, swimmers, schools, residents and traders) held their first meeting in May. At the June meeting the group considered how we can redevelop the space next to Forest Hill's Grade II listed library and considered the feasibility and housing options from the consultants, HLM. The Council is currently consulting local residents on the three concepts that have been produced for the development of a new leisure centre including a six-lane 25-metre pool, learner pool and associated dry leisure and community facilities. An exhibition was on display at People's Day on 12 July and the full exhibition was outside Forest Hill station on Friday and Saturday 18-19 July following the delivery of 20,000 flyers to homes in Forest Hill, Perry Vale and Sydenham wards. You can view the background papers and options online and take part in the survey at http://www.lewisham.gov.uk/foresthillpools. The exhibition was running at Forest Hill library until 8 August with residents providing feedback on the printed forms on the three options, range of facilities and other comments. Focus groups are taking place with 'seldom heard groups' in accordance with the Council's consultation strategy, and further active consultation is taking place with local schools, businesses, and swimming clubs. Council officers have offered to meet with representatives from both the Forest Hill and Sydenham Societies in addition to their ongoing involvement with the Forest Hill Pools Stakeholder Group. 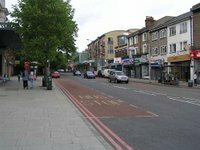 As an adjunct to the consultation programme a public meeting has been arranged for Thursday 21 August at the Forest Hill Methodist Church and Centre on Normanton Rd SE23. The meeting will run from 7pm to 9pm. The evening will include a presentation on the background to the Mayor's decision and will give local residents the opportunity to speak to local councillors and leisure officers about the current proposals. The exhibition which details the three development options will be available, and Council staff will be present to answer queries and to gather feedback on the options that have been presented as part of the consultation. The Stakeholder Group will be meeting at the end of August to review the feedback from the consultation. Comments from the Stakeholder Group will be included in the report to Mayor and Cabinet on 17 September which is an open meeting starting at 6.30pm at the Town Hall in Catford. The tender for the architects is running in parallel with the consultation so that work on the design can progress once the option is agreed. We look forward to seeing you on 21 August. If you have any queries about the meeting please contact Hilary Renwick on 8314 6359 - hilary.renwick@lewisham.gov.uk or contact Cllr Chris Best or Cllr John Russell who will be co-chairing the public meeting.